I don't like to stay out late. Sorry- this may be the City That Never Sleeps, but I am the Juliana Who Needs 8 Hours. I went out anyway that night, past my bedtime, to wish a fond farewell to a friend who was leaving New York. As usual, I had gotten wrapped up in writing that day and hadn't eaten enough calories to sustain the roughly 20 miles I had to walk to find the too-hip-for-a-sign bar we were going to in the East Village. My lack of sustenance intensified my sleepiness, but I was excited to meet up with my boyfriend Alex and see some friends. Being too poor to afford to buy a drink, I couldn't even enjoy the meager energy I would have synthesized from the simple syrup or lime juice in a fancy cocktail. We stayed at the bar, which was a pretty cool place after all, until I could bear my growling stomach no longer. We said our goodbyes, and left in search of a pizza place on the way to our subway station. All the while as we walked toward the train, I peeked my head around corners looking for an angelically glowing neon sign that would point me toward some life-saving carbs. There were none. "Is there NO pizza in this city?!" I exclaimed, a little louder and a little shriekier than I had intended. But it was true. There was no pizza. Or maybe like the bar, all the pizza places in the East Village are too cool for signs. "Everything they say about New York is a lie." I muttered, but Alex didn't hear me over the rumbling of my stomach. Our train ride home took an hour. Alex fell asleep on the seat next to me. I tried not to think about bread and cheese. When we got off the train, it was 12:30am and I wasn't sure if the lettuce wraps I had eaten 10 hours earlier had only been a dream. But then I saw it- a vision of an Aztec god, surrounded by a golden haze and a corolla of regal feathers. I blinked and my contact lenses blurred in my tired eyes. It was the side of the El Rey del Taco truck, and it was open for business. Without thinking, I broke into a jog, barely looking as I crossed the street or hearing Alex's sleepy protests for me to wait up. The menu was featured in photo form on the side of the truck, perfect for people who are too drunk or too tired to make sense of words. 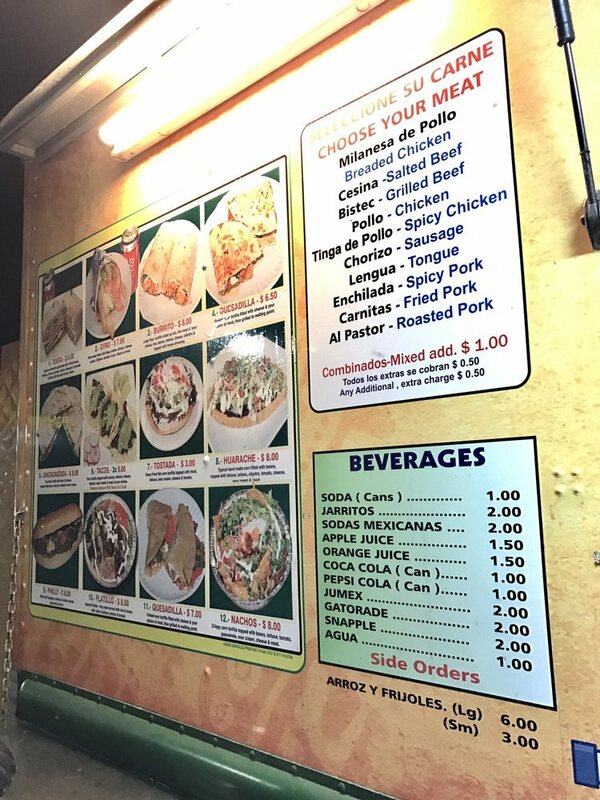 I scanned the images of Mexican food, and they were as beautiful to me as the first Monet I ever saw in person. "Ohhhh!" I heard Alex behind me, his voice a few octaves higher than normal. "Look at that cute dog!" I was trying to weigh the merits of a burrito versus a quesadilla, and my eyes didn't leave the picture menu. "Look," he tapped my shoulder. "Look!" I sighed loudly and gutturally from the back of my throat, whipped my head around for 1/10 of a second to see the small canine, and went back to trying to decide which food item would be the most delicious and the most filling. "Aw," Alex said, sadly now. "I thought it was a cute dog." "Quesadilla with chicken please." I said when the most benevolent looking man I have ever seen asked me for my order. He nodded, "You want everything on that?" It was ready in no time. "Quesadilla?" called the kindest and most wonderful food truck cook I have ever laid eyes on. "What did you get on it?" "Uh, chicken," I answered, and he took my cash. At only $6.50, the quesadilla was weighty and stuffed with ingredients. I looked even better than the photo on the side of the truck, which almost never happens. I ate it while walking home. Delicious white cheese stretched far from my mouth with every bite, and hot spicy juices dripped into the styrofoam container I held under my maw. Grilled peppers and onions soaked in hot sauce were tempered by cool fresh cilantro. Big chunks of juicy tomatoes tasted like summer as they burst in my mouth, and when they fell into the styrofoam, and I scooped them up with the chewy toasted flour tortilla. I was so happy that it was more than just meat and cheese, a true meal and better than I had hoped for. It seemed this quesadilla had in fact been gifted to me by the Aztec god emblazoned on the truck. I growled at Alex when he asked for a bite, but we always share food as a rule. Besides, I felt bad for not being nice to him about the dog, and it really was cute. I held the styrofoam under his mouth as I fed him. He chewed and nodded approvingly, but then I saw a confused look on his face. "Didn't you get chicken? That's not chicken." I had eaten half of the quesadilla without thinking about it, but as I finished chewing the bite that was still in my mouth I realized the flavor and texture could not possibly be chicken. I looked at a piece of meat that had fallen into the take out container. "Umm, it's steak? Or maybe pork..." I shrugged and kept eating. "Ok, mystery meat it is." Alex laughed. By the last few bites, my hunger had been sated enough that I could really savor how amazing this quesadilla truly was. I was so grateful for New York, and street food, and El Rey del Taco, the King of Tacos. When I got home I actually felt sad about brushing my teeth because it would wash away the incredible flavor that still lingered. Next time you see that golden Aztec god parked outside the CVS, I definitely recommend you stop for a bite. Maybe be cautious if you have food allergies or really important dietary restrictions. But also throw caution to the wind because good food is good food, even if you're not totally sure what's in it.